Editor’s note: This article is by Bradley Eck, IBM Research-Ireland’s Smarter Cities Technology Centre manager in Dublin. A faucet that drips just once per second wastes 2,700 gallons of water, annually. My Water and Environment team is developing tools and methodologies, as part of an EU-funded project called iWIDGET, to manage urban water demand by reducing waste like leaky taps. 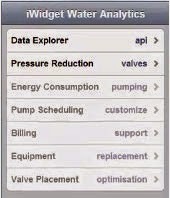 iWIDGET links 9 expert partners together to look at how analytics and smart meters can help cities and their citizens get real-time data on their water and related energy usage – with the aim of improving the management of urban water demand by reducing waste, and improving utilities’ understanding of end-user demand, and ultimately reducing customer water and energy costs. iWIDGET provides householders with easily accessible information that will allow them to make decisions on how to reduce water usage, and thus, their water bills. Plus, as utilities will have better visibility on their customers’ usage, they will be able to more-accurately forecast demand – and send their customers alerts if a leak is suspected. For our part, my team in Dublin focused on iWIDGET’s system architecture to improve a utility’s planning, operation, and management of real-time sensor data, and developed analytics around the high-resolution consumption data. Not an easy task, as this involves noisy raw data and dozens of third party systems and analytical tools. So, we built an API for the entire system that connects and interfaces with each partner’s components. Some of the components can be accessed via mobile applications. Meter Replacement, for example, looks at the history of readings and meter type to determine the best time to replace their meters. Another app focuses on pump scheduling, where real time data from smart meters feed in to a pumping plan that helps reduce energy costs. iWIDGET system trials have started in Portugal, Greece and the UK, and will conclude in 2015. The envisaged outcome of the iWIDGET project is increased interoperability between water information systems at the European Union and national levels, and overall improved efficiency of water resource management. For more information on the project please visit the iWIDGET project website, or join our group on LinkedIn, or follow @iWIDGET_FP7 on Twitter.